The election results in Ontario are very disturbing. Who is Ford and how did he win? The Conservative Party (known in Ontario as the Progressive Conservatives, or PC) won the Ontario election with 40 percent of the popular vote. However, due to our backwards, single-member-plurality electoral system, that 40 percent translated into a majority government with 61 percent of the seats in the provincial legislature. This will allow the PCs a free hand within the legislature to do as they like. Our new provincial premier is the right-wing populist Doug Ford, brother of now-deceased Rob Ford, the controversial and scandal-plagued former Toronto mayor. Doug Ford himself served as a city councilor during his brother’s tumultuous reign as mayor. He narrowly won the PC leadership race with the backing of the party’s most right-wing (and socially conservative) elements and against the wishes of the party establishment. In the run-up to the election, there was a lot of comparison made between Doug Ford and Donald Trump. And indeed, there are similarities, but they should not be overdrawn. Like Trump, Ford is a bombastic, mainstream media-hating, sexist, wealthy white man who inherited his fortune (and the company he runs with his other brother) from his father. He attacks the “elites” — by which he does not mean the rich and powerful, but career politicians, the media and urban Toronto “liberals” who do not share his worldview. Ford was also supported by racist alt-right figures in Ontario and had at least one candidate with a history of openly racist and homophobic comments from his days as a Rebel Media journalist. A conservative front group, Ontario Proud, engaged in a racist, anti-immigrant campaign against the social democratic New Democratic Party’s (NDP) support for a sanctuary province policy, claiming it would destroy public services and waste the tax dollars of voters. The campaign was also plagued by scandal, with one-quarter of PC candidates facing lawsuits or under investigation for various forms of malfeasance at the time of the election. On the other hand, Ford himself generally didn’t make systematic recourse to open racism and virulent anti-immigrant hostility the way that Trump did during his campaign (Ford did suggest that the province should take care of Northern Ontarians first before permitting an increase of immigration to the region). He also has had more than a dozen candidates of color running under the PC banner, and while it’s too early to say exactly who voted PC in detail, it seems clear that he did win some working-class support, including in parts of the Greater Toronto Area, and including among people of color. The depth of animosity toward “politics as usual” more generally and the centrist Liberal Party specifically — after 15 years in power, several scandals and a weak economy — cannot be understated. The financial and manufacturing center of the country, Ontario has seen significant manufacturing job losses over the last few decades, which have hit certain areas of province quite hard — while the Greater Toronto Area has seen skyrocketing living costs, deepening (and very racialized) inequality and growing poverty. This trend was exacerbated by the 2007-08 Great Recession. Thus, in a context in which unions have shown little fight (with a notable exception or two), and the NDP has moved consistently to the political center in a warm embrace of neoliberalism, Ford’s mantra of government and “elites” being out of touch with “hard working taxpayers” and his attack on Liberal corruption clearly has wide resonance. In fact, Ford’s campaign itself did not have an actual platform in the conventional sense, just vague promises that raised more questions than they answered. Ford did promise $7.6 billion in annual tax cuts and a balanced budget in three or four years, but unlike the last hard-right government in Ontario (that of Mike Harris, from 1995 to 2002) — and perhaps a sign of the shifting political terrain in which there is now greater political risk in boasting about your slash-and-burn fiscal agenda — he assured people there would be no major cuts or job losses. Instead, Ford claimed he would find “efficiencies” — to the tune of several billion dollars a year — in government operations. How did the other parties do? The Liberal Party’s vote dropped sharply from 38.6 percent of the popular vote in the last election in 2014 to 19.5 percent of the popular vote this time around, which translated into seven seats — not enough to receive party status in the parliament (which impacts funding for staffers and speaking rights in the legislature). However, their popular vote didn’t collapse to the extent many thought (and on the left hoped) it would, and in some districts, they remained strong enough to split the vote with the NDP, allowing the Tories to win. But the one of the biggest stories during the campaign was the growth of the NDP. The NDP had not been a serious electoral threat in Ontario since the early 1990s, when it formed a government during what at the time was the deepest recession in Canada since the Great Depression. It brought in a few small reforms, and then, in the name of deficit reduction, it imposed wage freezes and unpaid days off on public-sector workers and began a campaign against “welfare fraud,” alienating itself from unions and left-wing activists. After campaigning to the right of the Liberals in the last provincial election and suffering a disappointing result (an experience repeated by the federal NDP in 2015), the Ontario NDP tracked to left this time with a platform that committed to maintaining a planned increase to a $15-an-hour minimum wage in January 2019 and labor law reforms passed by the Liberals, dental care, a modest pharmacare program, replacement of student loans with grants, and increased funding for overcrowded hospitals. As a result, despite media, PC and Liberal warnings about reckless spending and runaway deficits under an NDP government, the campaign gained traction. The NDP started the campaign a distant third, but steadily built momentum, and with a week to go, according to some polls, it was threatening to overtake the PCs. In the end, the NDP saw a bigger proportional jump in votes than the PCs — it increased its popular vote from 23.7 percent in 2014 to 33.5 percent this time around. The NDP also led among women and people under 44. There has been a debate on the left about one of the parties, the NDP. What should the left’s posture toward the party be? The NDP was formed in 1961 as a pro-capitalist workers’ party with strong ties to the union officialdom and real support in sections of the working class. Like social democratic parties in Europe, it has moved to the right, though more slowly and less brazenly than, say, Labour in Britain. Its leaders accept neoliberal capitalism. Federal NDP officials were, in fact, keen to try to copy the Obama playbook for electoral success. They would like to make the party more like the Democrats — Clinton’s version, not Sanders’s! Although there are plenty of members who are more left wing, they are mostly unorganized, and those organized progressive currents that do exist remain relatively small. With only a very few exceptions, the NDP’s federal members of parliament and members of the provincial legislatures only think of politics in terms of elections. And so, while the Ontario election undoubtedly represents a positive turn for the party in terms of its platform, it does not change what it is or the need to build an alternative party rooted in movement building. Notably, save for a few candidates, the NDP did not actively seek to deepen ties with and garner support from social movements and organizers in the way Bernie Sanders and Jeremy Corbin did. Post-election, we can expect the NDP to try to channel protest against Ford away from the kind of broadening and escalating fightback in the streets and in workplaces that is needed. People who understand this should try to draw as many NDP supporters as possible into efforts to build an active fightback, but also work to keep these efforts from being subordinated to the party. What will Ford do in power? Will his program be like Trump? And what will this mean for politics in the whole Canadian state? 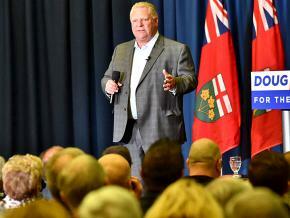 Given the vagueness of his platform, it is hard to say with certainty what Ford will do in power. But there are some potentially serious dangers lurking on the horizon. For instance, his tax cuts and promises to balance the budget in a few years will come at a severe price. It his hard to believe that he won’t pursue massive cuts to public spending, with the resulting job loss to public-sector workers and harm to people who access public services this will entail. The Canadian Union of Public Employees (CUPE) has modeled three scenarios for potential job cuts: an optimistic scenario (70,000 to 46,000 layoffs), a more likely scenario (87,000 to 62,000) and the worst-case scenario (as high as 135,000). On top of those possible public-sector cuts, Ford has committed to terminating the planned increase of the minimum wage to $15 an hour, while business owners are advocating for a rollback of other labor law reforms implemented by the Liberals. He has vowed to get rid of Ontario’s cap-and-trade program, which he wrongly calls a carbon tax, and not surprisingly, he has no alternative plan for a genuine reduction in carbon emissions. During the campaign, he raised the specter of opening up development in northern Ontario in the so-called Ring of Fire, a controversial plan that will face opposition from some Indigenous communities. What has been the response in Ontario to Ford’s election by unions, community organizations and the left? These are early days still. But discussions are already occurring, informally and in organized spaces, about building a fightback. Articles discussing the strength and limits of the 1990s Days of Action strike wave against the last hard-right government in Ontario have been circulating. The Ontario Federation of Labour (OFL) and Fight for $15 and Fairness campaign planned a post-election rally for “Good Jobs” before the election, which will likely draw thousands. People are no doubt disappointed, particularly those who held out hope that the NDP would be able to pull off a late surge and the victory. But people also clearly see both the need and possibility of building some kind of resistance. It is important to remember that 60 percent of voters opposed Ford, and when we consider that 42 percent of eligible voters didn’t cast a ballot, Ford’s electoral support amounts to only 23.5 percent of all potential voters. The energy around the NDP’s progressive campaign can also potentially be drawn on to build the resistance. The challenges are undoubtedly significant, and the stakes high, but the possibilities of building broad and escalating resistance are real.